Posted 7/6/2018 3:58pm by David Paulk. We have a lot of fresh, delicious certified organic summer vegetables for you. And the weather should be actually enjoyable with a high in the 70's, lower humidity and low chance of rain. Great day to pop by the market to pick up your veggies for the week and meet your like-minded friends! We so appreciate that you take the time to come to our stand. We also really look forward to seeing and talking with you! Thank you! - Tomatoes, Big Heritage & Red Slicers! (More! ): We have two types of heritage tomatoes! One is essentially identical to Cherokee Purple and the other is sweeeet!! - Fingerling Potatoes! (New! ): Fresh-harvested, delicious Austrian Crescent fingerlings! Cut in half or in slices, toss with a little olive oil and bake at 350 degrees F until fork tender, longer if you want them to crisp up. Sprinkle with sea salt for tasty, easy side dish. - Shallots: Yes, shallots fresh, straight from the earth to you. Okay, we did wash them. They are sweet and amazing tasting. Try sauteed with our green beans, kale, or chard. Posted 6/29/2018 6:12pm by David Paulk. We have quite a variety of vegetables for your weekend and 4th of July cookouts. The big news is that we have fresh organic sweet corn, cucumbers, basil and shishito appetizer peppers! Also...red, white and blue potatoes for a patriotic potato salad! That's 3 varieties of potatoes, each a different color! Just imagine...your potato salad will be the hit of the party! Yes, it'll be a hot one tomorrow, but it will only be in the 70's the first hour of the market...so come on down early. As usual, we have a few items in smaller quantities that aren't listed below for the early birds. We look forward to seeing you! Thank you so much for your support! - Patriotic Potatoes, Red, White and Blue (New! ): Three varieties of Irish potatoes, a blue, a creamy white and a red, that make a delicious and very patriotic potato salad! - Basil (New! ): Fresh, large bunches of aromatic basil! Wonderful sprinkled into sauteed vegetables, great on pizza, as pesto, and many more dishes. 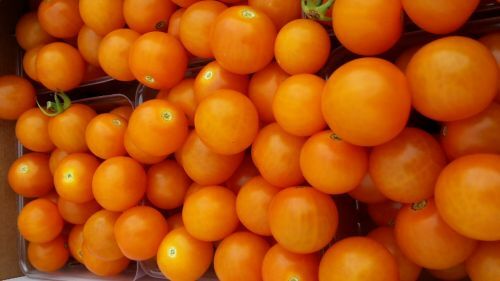 - Tomatoes (Limited Quantity): Variety of first of the season tomatoes: red slicers, heritage and cherry. - Shishito Peppers (New! ): First of the season shishito's. Delicious, green sauteeing, appetizer peppers from Japan! Just ask about them at the stand if you've never tried them. Great served with a cold beer or dry white wine. - Arugula: Your favorite spicy green! - Green Beans: We have more tasty green beans for your spring salads. Think Salad Nicoise with green leaf/romaine, new red potatoes, beets, carrots, green beans and fresh market eggs, hard boiled. Wow! - Cucumbers: Tasty, sweet, asian cucumbers. Similar to English cucumbers. Sweet, thinned skinned and almost non-existent seeds. 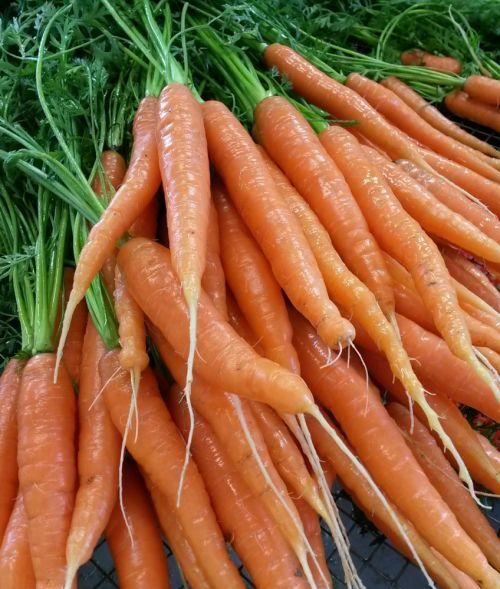 - Fresh Carrots: We have a new planting of carrots that have sized up and are crisp, tasty and ready to be roasted or eaten raw on salads or with your favorite dips! - Romaine Lettuce: Freshly harvested from our farm directly to you! There's nothing else like a crisp head of romaine for your salads or on the grill. - Green Leaf Lettuce: Fresh, spring green leaf lettuce. Perfect for your salads and burgers! See easy homemade salad dressing recipes at www.sassafrascreekfarm.com/recipe . 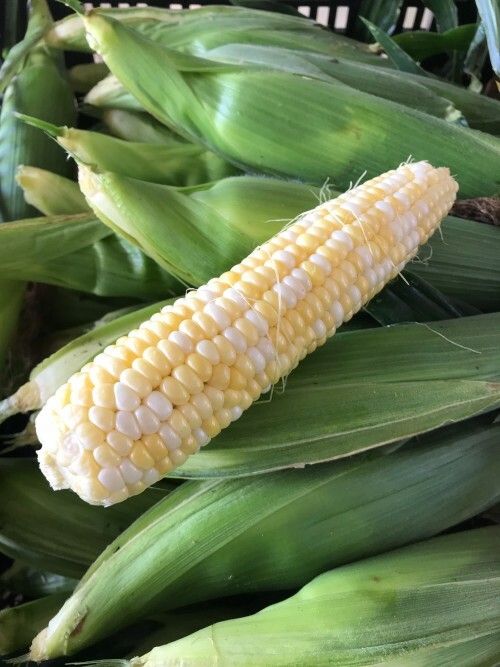 - Sweet Corn: Fresh, certified organic, bi-color, super sweet corn! 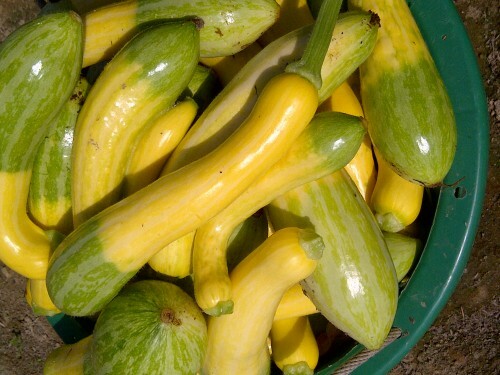 - Summer Squash, Zucchini & Zephyr: We have plenty of both kinds of summer squash. Delicious grilled or sauteed with our red or white onions, as a side dish to accompany steak, chicken or pork! Posted 6/22/2018 4:26pm by David Paulk. It's officially summer with Summer solstice happening this past Thursday - the longest day of the year. With summer heat, comes summer veggies that we all love so much. The big news for this market is we have sweet corn, garlic and superstar onions! We also have many more delicious and healthy veggies listed below for you to enjoy. A few nice surprises for the early birds. Please see photos below and recipes on our Web site. Thank you for your support. We look forward to seeing you! - Sweet Corn (New! 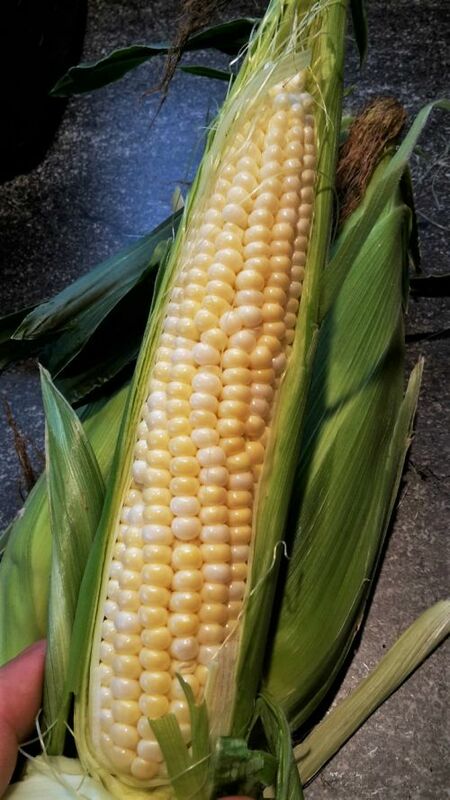 ): Fresh, certified organic, bi-color, super sweet corn! - Garlic (New! ): The scapes are gone, but now we have fresh, large, delicious heads of garlic! - Superstar Sweet Onions (New! 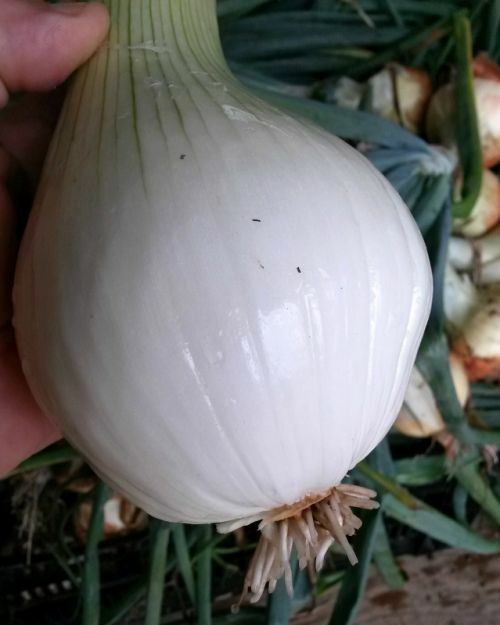 ): Delicious, freshly-harvested sweet onions, like Vidalia onions! Wonderful raw or cooked. These are the amazingly sweet onions you've enjoyed from our stand for years now. - Arugula (Back! ): Your favorite spicy green is back! - Cucumbers (New! ): Tasty, sweet, asian cucumbers. Similar to English cucumbers. 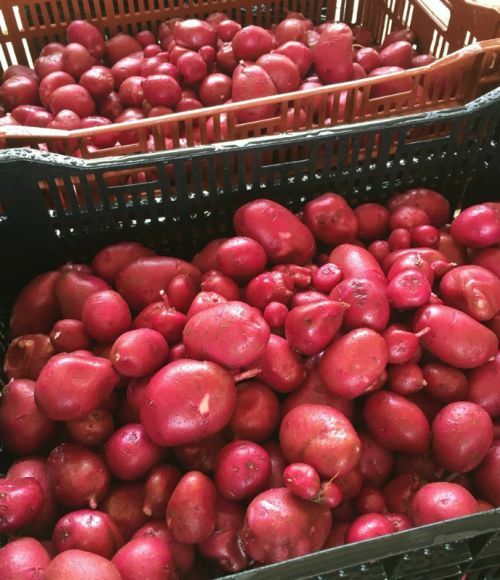 - New Red Potatoes: These are freshly-harvested red potatoes. If you've never tasted fresh potatoes, now is your chance! The flavor is wonderful! Try them boiled or roasted, just until fork tender, with our green beans! - Organic Pepper & Tomato Plants for sale! Posted 6/15/2018 4:53pm by David Paulk. I can't think of a better way to show your dad how much you love and appreciate him than to serve him farm fresh, organic veggies on Father's Day! We have lots to choose from tomorrow, such as New Red Potatoes, green beans, fresh lettuce and summer squash. We look forward to seeing you, your family and friends on what will be a glorious weather day. Remember, the early bird gets the worm, so to speak. - New Red Potatoes (New! ): These are freshly-harvested red potatoes. If you've never tasted fresh potatoes, now is your chance! The flavor is wonderful! Try them boiled or roasted, just until fork tender, with our green beans! - Carrots (Back! ): We have a new planting of carrots that have sized up and are crisp, tasty and ready to be roasted or eaten raw on salads or with your favorite dips! - Rainbow Swiss Chard: Beautiful, glossy leaves and colorful stems. They have just as many nutrients as kale. Simply sautée some sweet red onions first and then add the chopped leaves, along with the the sweet, crunchy stems, maybe toss in some roasted pine nuts for a Mediterranean treat! Makes a great side dish! Posted 6/8/2018 2:23pm by David Paulk. We have plenty of your favorite vegetables at market tomorrow, including zucchini and zephyr summer squash, green beans, beets, salad mix, and more! See full list below. Please don't be deterred by the weather forecast (It seems that I've been saying this for weeks now!). Even though the rain probability is high-ish, the actual amount of rainfall is expected to be low. We appreciate your support and look forward to seeing you, your family and friends! Thank you! - Romaine Lettuce (New! ): Freshly harvested from our farm directly to you! There's nothing else like a crisp head of romaine for your salads or on the grill. 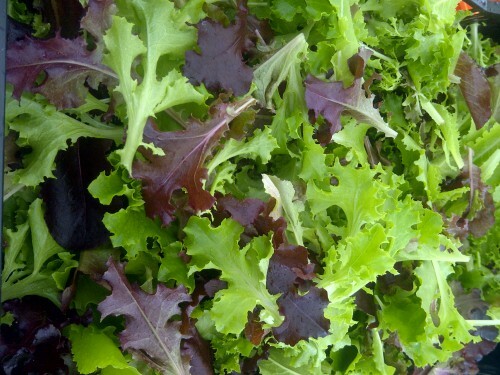 - Green Leaf Lettuce (New! ): Fresh, spring green leaf lettuce. Perfect for your salads and burgers! See easy homemade salad dressing recipes at www.sassafrascreekfarm.com/recipe . - Arugula: The spicy green you crave! Try as a bed for grilled salmon or sprinkled on pizza as soon as it comes out of the oven. Yum! 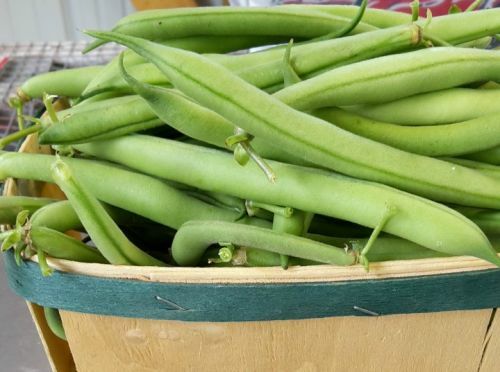 - Green Beans: We have tasty green beans for your spring salads. Think Salad Nicoise with salad mix, beets, carrots, green beans and fresh market eggs, hard boiled. Wow! - Kohlrabi: Never tried Kohlrabi? Now is your chance! It is in the cabbage family and is great raw or cooked. Peel first like a carrot, then try raw sliced or grated in your salad or roasted with chicken or as a side dish. Yes, you can eat the greens! Simply sautee like you would kale or chard. Learn more at Kohlrabi Health Benefits & Recipes. - Salad Mix: Convenient, delicious and ready to eat salad. Perfect blend of red and green butter heads and oak leafs. 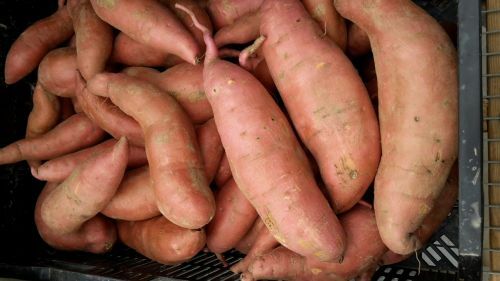 - Sweet Potatoes, Covington and Murasaki: We have your favorite orange sweet potatoes and purple Murasakis. Murasaki's are a Japanese sweet potato that is purple on the outside, white on the inside, and has a vanilla, chestnut flavor. So, easy to bake whole or slice and roast as sweet potato fries. Just slice 1/4 inch thick, toss with a little olive oil, roast in oven at 350 degrees for 15 mins, flip the slices and roast for about 5 mins more, sprinkle course salt (and pepper, if you like). That's it! You have a guilt-free, sweet and so-good-for-you side dish for lunch/dinner or serve with eggs at breakfast! Posted 6/1/2018 3:52pm by David Paulk. We have quite a few new veggies listed below for market tomorrow. 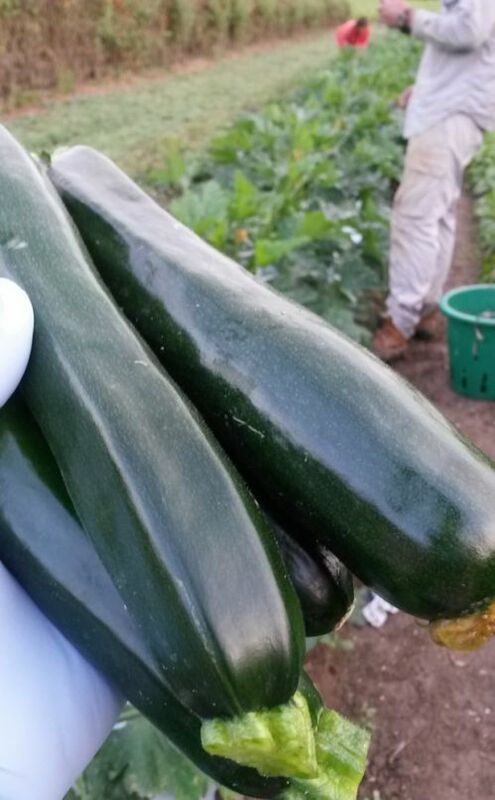 We have a lot fresh zucchini and zephyr summer squash! And, guess what?... It's garlic scape season! 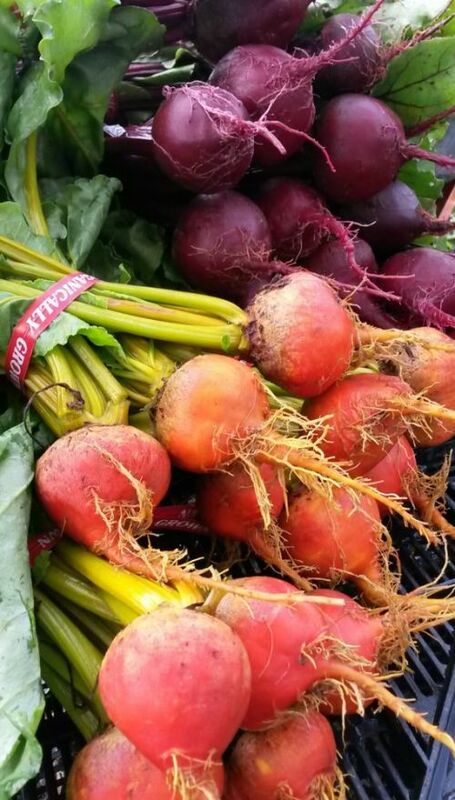 We also have three kinds of beets, more green beans, a new white onion, fresh shallot bunches; and swiss chard and murasaki sweet pototaoes are back! AND we have a new veggie, Kohlrabi! More info. below. Please don't be deterred by the weather forecast. Even though the rain probability is high, the rain will be light before noon. We look forward to seeing you! - Green Beans (New! ): It's the first flush of tasty green beans for your spring salads. Think Salad Nicoise with salad mix, beets, carrots, green beans and fresh market eggs, hard boiled. Wow! - Kohlrabi (New! ): Never tried Kohlrabi? Now is your chance! It is in the cabbage family and is great raw or cooked. Try sliced or grated in your salad or roast as a side dish. Learn more at Kohlrabi Health Benefits & Recipes. - Shallots (New! ): Yes, shallots fresh, straight from the earth to you. Okay, we did wash them. They are sweet and amazing tasting. Try sauteed with our green beans, kale, or chard. - Sweet Potatoes, Murasaki (Back! ): Japanese sweet potatoes that are purple on the outside, white on the inside, and sweet with a vanilla, chestnut flavor. Roast whole or slice, toss with olive oil and bake on a cookie sheet at 350 degrees F for 15 - 20 mins, until fork tender, for a satisfying dish served at breakfast, lunch or dinner. - Rainbow Swiss Chard (Back! ): Beautiful, glossy leaves and colorful stems. They have just as many nutrients as kale. Simply sautée some sweet red onions first and then add the chopped leaves, along with the the sweet, crunchy stems, maybe toss in some roasted pine nuts for a Mediterranean treat! Makes a great side dish! - White Onions (New! ): Freshly-harvested and delicious raw in a salad or on a burger; sauteed or grilled! - Sweet Potatoes, Covington: We have your favorite orange sweet potatoes and purple Murasakis (described above). So, easy to bake whole or slice and roast as sweet potato fries. Just slice 1/4 inch thick, toss with a little olive oil, roast in oven at 350 degrees for 15 mins, flip the slices and roast for about 5 mins more, sprinkle course salt (and pepper, if you like). That's it! You have a guilt-free, sweet and so-good-for-you side dish for lunch/dinner or serve with eggs at breakfast! Posted 5/25/2018 3:04pm by David Paulk. One word...strawberries! 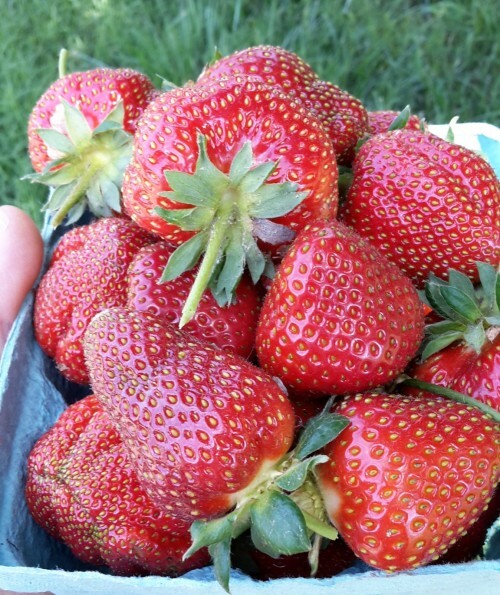 We have a lot of fresh, certified organic strawberries for your Memorial Day weekend get-togethers! We also have a few new items you'll see listed below, as well as a lot of your favorites, such as salad mix, arugula, carrots and sweet potatoes. No rain forecasted until end of market. So, come out with family and friends and get your Memorial Day fresh, organic veggies! - Strawberries (We have a lot! ): Fresh-picked certified organic, local strawberries. The only ones in St. Mary's County! - Beets (New! ): Sweet red beets! 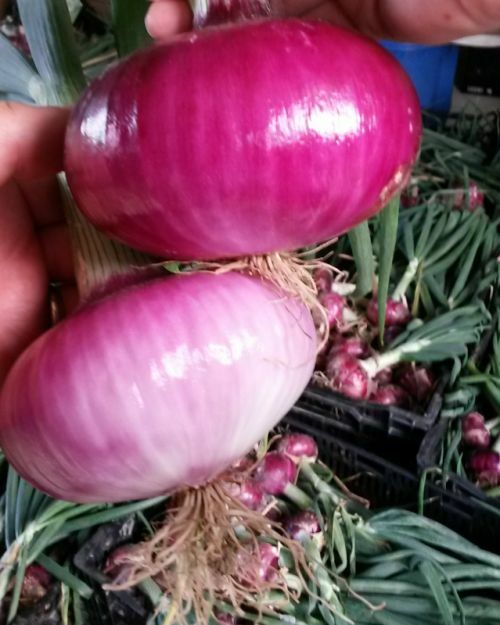 - Sweet Large Red Onions (New! ): Freshly-harvested and delicious raw in a salad or on a burger; sauteed or grilled! - First Summer Squash (New! Limited Quantity): Zucchini and a little Zephyr. - Salad Mix: We have lots of salad mix! Convenient, delicious and ready to eat salad. Perfect blend of red and green butter heads and oak leafs. Posted 5/18/2018 6:14pm by David Paulk. YES! We WILL be at market tomorrow! We will have plenty of fresh arugula, crisp carrots, kale, salad mix, spinach and more! It would so lift our soggy, muddy, damp (you get the idea) spirits to see your lovely faces at the market. You are the reason we grow and we very much appreciate your support. So, come on down to the market to buy your local, certified organic veggies for the week and be seen in your fancy raincoats, galoshes and umbrellas. As the Irish would say, it will be a grand soft day with a bit of spitting tomorrow. 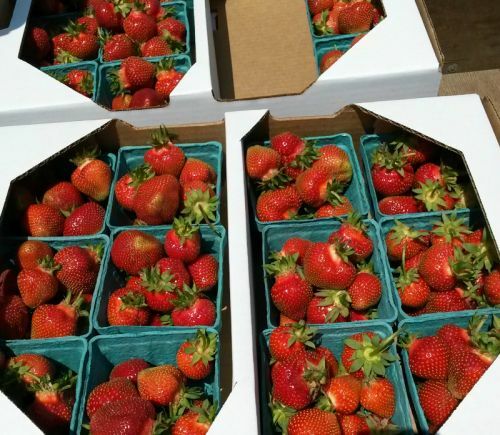 - Strawberries (very limited supply)! - Arugula (Back! ): The spicy green you crave! Try as a bed to grilled salmon or sprinkled on pizza as soon as it comes out of the oven. Yum! - Certified Organic Transplants for Sale: Basil and varieties of tomatoes. - Radishes: Beautiful, crisp and tasty! Of course great on a salad, but try eating them with a little salt and butter, as they do in France, Germany and Eastern European as an appetizer. It may sound unusual, but the flavors really compliment each other. - Spinach: We have lots of spinach! 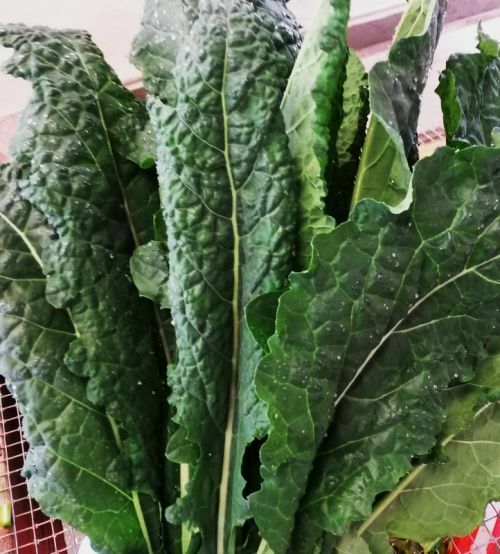 Freshly harvested, tasty, perfect-sized spinach that is ready to eat as a salad, steamed, sauteed, or juiced. Posted 5/11/2018 4:17pm by David Paulk. Since the weather is really starting to heat up, we have certified organic basil and tomato transplants for your home garden! As always, we have our very fresh, nutritious, bursting-with-flavor veggies, grown on our farm just for you, right here in St. Mary's County! So, please take just a few minutes out of your day to swing by the market, stock up for the week and support your local farms at the same time. It will be in the 70's - 80's tomorrow. We look forward to seeing you! - Certified Organic Transplants for Sale (New! ): Basil and five varieties of tomatoes. 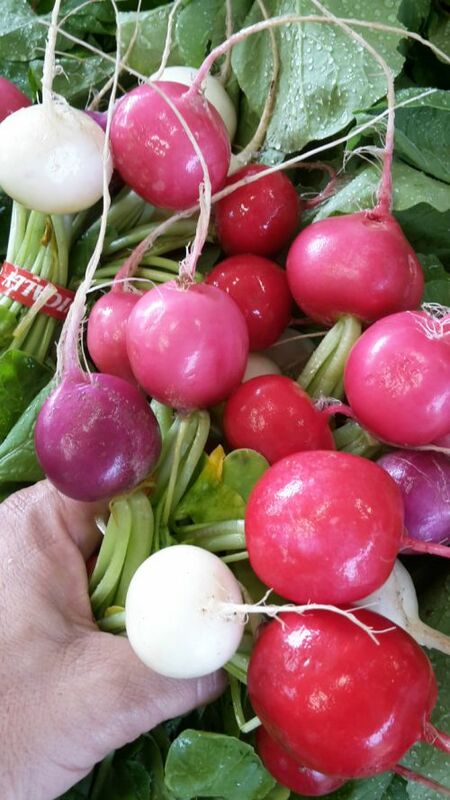 - Radishes, Red & Lollipop: Beautiful, crisp and tasty! Of course great on a salad, but try eating them with a little salt and butter, as they do in France, Germany and Eastern European as an appetizer. It may sound unusual, but the flavors really compliment each other. Posted 5/4/2018 4:18pm by David Paulk. 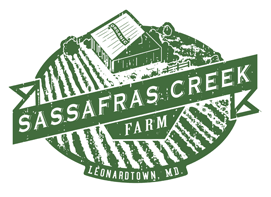 Nothing compares to our very fresh, nutritious, bursting-with-flavor veggies, grown on our farm just for you, right here in St. Mary's County! So, please take just a few minutes out of your day to swing by the market, stock up for the week and support your local farms at the same time. It will be in the 60's; rain not likely until noon. We look forward to seeing you! 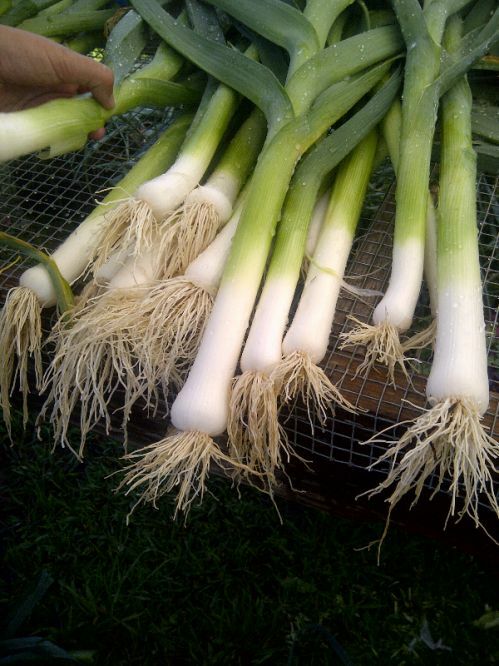 - Leeks: Our leeks are particularly delicious this spring. I mean, really good. They are great in any dish in place of an onion, but are a key ingredient in dishes with fish or potatoes. See the "pot au feu" recipe on our Web site. It is classically made with beef and leeks, but has been adapted into this very easy, simple, light and delicious dish with cod, halibut or other firm white fish. Perfect for the cooler weather this weekend! 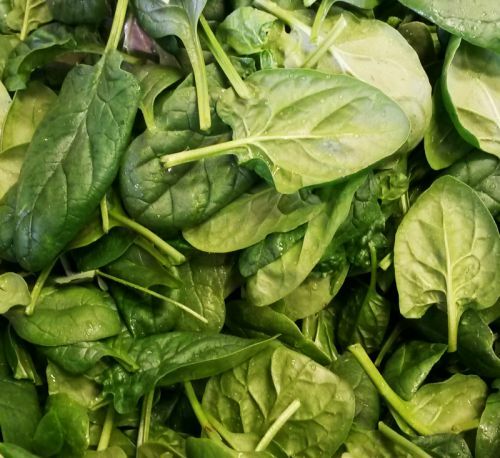 - Spinach: Freshly harvested, tasty, perfect-sized spinach that is ready to eat as a salad, steamed, sauteed, or juiced. - Sweet Potatoes, Covington & Murasaki: We have your favorite orange and purple (Japanese Murasaki) sweet potatoes. So, easy to bake whole or slice and roast as sweet potato fries. Just slice 1/4 inch thick, toss with a little olive oil, roast in oven at 350 degrees for 15 mins, flip the slices and roast for about 5 mins more, sprinkle course salt (and pepper, if you like). That's it! You have a guilt-free, sweet and so-good-for-you side dish for lunch/dinner or serve with eggs at breakfast!